My dog was quivering by 6:30 a.m. He really doesn&apos;t like loud noises, and Monday morning&apos;s thunderstorm was certainly not his preferred way of waking up. He was hardly alone, as, across all of Southern California, an early morning storm reminded Angelenos that, yes, weather other than &apos;sunny&apos; and &apos;partly cloudy&apos; does happen sometimes. But unlike last week, where some Monday morning rain deferred to some very hot and extremely dry conditions by Thursday, the rain this Monday morning is a sign of things to come. 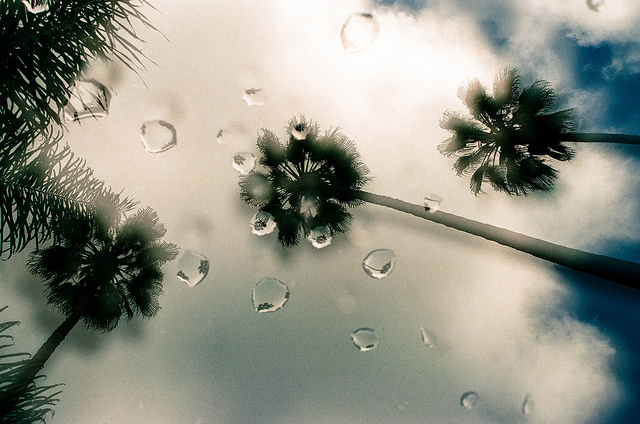 According to the National Weather Service, Angelenos can expect scattered showers and thunderstorms through Monday afternoon. Stormclouds will return to Southern California on Thursday and Friday, potentially bringing up to 2 or 3 inches of rain. "We used a fair number of words that indicate uncertainty in our release about the system we expect to move through on Thursday or early Friday," said Kathy Hoxsie, a meteorologist with the National Weather Service. "We&apos;re confident we will get some precipitation from that system, but how much depends on how far south the low-pressure drops. Precipitation levels could be similar to today [Monday], or it could be as much as 2 or 3 inches of rain." For the most part, the amount of recorded rain this Monday has been relatively low, though certainly measurable the farther east you move. Hoxsie reported that, as of 9 a.m. Monday, more rain had fallen on Mt. Baldy—0.78 inches—than anywhere else in Southern California. Claremont received 0.62 inches on Monday morning, Redondo Beach 0.20 inches, downtown L.A. 0.07 inches, and Northridge 0.03 inches. The question for Thursday, as Hoxsie mentioned, is how far south the low pressure system moves. If the pressure system moves far enough south (just north of Los Angeles), its counter-clockwise spin could end up pulling a significant amount of moisture off the Pacific. If that happens, the National Weather service warns of potential flash floods and mudslides in areas that were recently hit by wildfires, as well as potential pooling of water on the roads and freeways. Roadways will be slick regardless, so just slow down. As for the other days of the week, Tuesday and Wednesday will be mild fall days—sunny skies with temperatures in the low to mid 70s (perfect). The weekend will be similarly mild, if not a little cooler with temperatures in the mid to upper 60s.